Two photos (one visible, one near-infrared) taken by balloon aerial rig on Sunday July 31 were composited to reveal this plume. The video tutorial on how to composite images like this is linked from the Near-Infrared Camera Tool page - scroll down to find it. 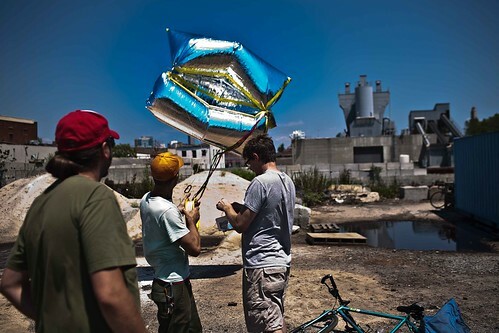 These images were collected by the GLAM crew in partnership with the Gowanus Canal Conservancy, and with canoes contributed by the Gowanus Dredgers Canoe Club. So cool ! I'd love to see the sample of this water - how would you prove that what we see is oil? Is there a way to do that? Working on it... spectroscopy! I have some samples and will be gathering more. This is so awesome! A really important step in identifying the uses for DIY near infrared photography! the infrared took a subtle feature and put it in stark relief. cool! Great work! This infrared image shows how cool low cost photography can provide useful information to the community, and give us clues for further research work. This particular site is well known to researchers mapping Gowanus historical stream patterns. If you look at Frame 19 of this movie: http://vimeo.com/23532919 you will see a welded steel plate against the bulwark, right under the graffiti of the flying bird. If you go out at low tide, and stick your head near the mud and look up, you can see a pipe discharging clear water into the Canal. This water is most likely a historical stream remnant of the Denton Mill's Pond / Vechte's Canal wetlands system, now buried under what will become the Whole Food's parking lot. This running water presents an opportunity for the new Whole Foods waterfront park designers. Ecologically, this spot is interesting because the clear water pools in the sewage contaminated canal attracts spawn fish, which in turn attracts herons. Th oysters that had colonized this particular steel bulwark were killed when the flushing tunnel was turned off (causing water pollution level to rise). It is hoped that by better mapping such as what is being done here, we can identify opportunities to improve the Gowanus estuary's health and water quality. I've been re-reading a bunch of entries to re-familiarize myself with the NIR camera and a rather simple question about this plume occurred to me which is: what properties of this plume are causing it to be identified? Plants make clear sense since they reflect near infrared light, but my understanding from the write up about it in Tech President is that it's a flow of water, so why would this plume be visible in NIR? @eymund , would you like to respond? This was a classic case of having to be very careful when interpreting aerial photographs. There really was an concealed outflow at this location, which we have on video tape as flowing. However, after closer study, the plume is not from that outflow, but from tidally transported sewage scum that happened to be positioned right at the outflow when we took this aerial photograph. It would be like a detective taking photographs of red "blood" spots outside a murder scene, just as a painter was repainting the house red. This plume is most likely visible in NIR because Gowanus sewage scum is typically made up of ground up styrofoam particles, to which sewage bacterias, restaurant grease and algae then attach themselves. 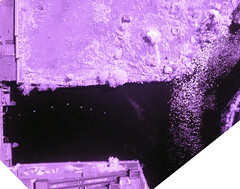 Depending on the time of year, large amounts of leaf litter and pollens also get clumped together with the sewage floatables, causing the plume to show up in the infrared signature.